Remember Sept 27th, 2001? We were one nation, united in grief. We all joined together, and under the advice of George W Bush and his team of advisers, we joined together to... go to the mall. Sure, people were still pulling bodies out of the rubble, and firefighters were still on the site working around the clock without adequate protection due to budget cuts, and stupid calls by EPA administrators. But there was an economic slump we had to deal with. 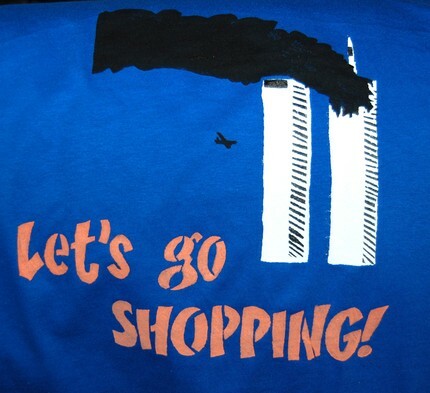 Speaking of shopping, buy this shirt! 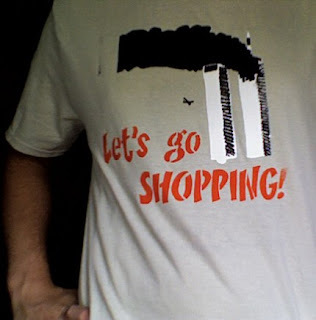 Let's exploit 9-11 some more!